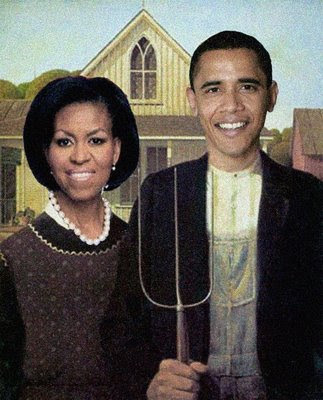 Politico is reporting Obama told a meeting of Bank CEOs, “My administration is the only thing between you and the pitchforks.” Just as my natives and I were reaching for the farm implements, he picked up the meme. Coincidence or not, let's get out the whetstones for a few minutes while we sharpen our blades and prongs. Consider the cheap-o gifts to England's PM and the Queen. DVDs and an iPod. What message do they send? These tokens don't have to be painstakingly wrought by hand from a brass cannon on the HMS Victory into a pen-holder to be culturally valid. You get them at Best Buy. The gifts were cheap and commonplace yet powerful. They were chosen carefully for their symbolism to refute and say it's ok for a head of state to give a simple gift which is not an everlasting obligation. Michelle Robinson Obama, a black American woman descended from slaves, steadied the old Queen of England with her right arm on their first meeting, and Elizabeth demolished protocol by embracing her back. Kenya used to be one of England's troublesome colonies when the Queen was a young woman. I would invite you to read Plutarch's Lives and find symbology more powerful. Our fearless leader is on a tour of Europe and held a town hall in Strasbourg. I've been there, had a fantastic five-course meal for twelve bucks and it's long been a No-Man's Land between France and Germany. Obama chose it as the venue for a Town Meeting. What other President would have? None other. He restored much lost world goodwill this week. We are still being looted, and ask not what your banks can do for you...ask what you can do for your banks. The bleeding continues, and our currency is on IV. This guy has studied long at the feet of the Masters, and he is out-doing them. I don't know if it's fixable, it probably is not. But he is no Blair, he knew the train wreck he was striding into and I would have none other. Obama knows his job above all else is to set the tone, to level a framework tilted out of whack. He is doing that job well. Evil details race astray like innumerable cockroackes and while Obama is an economic naif it doesn't really matter because that prostituted pooch was already screwed. I want to see malefactors frog-marched more than anyone else because I understand what they did but I also know that politicians are scapegoating bankers and honest brokers for the bribes they took and the laws they, the legal gatekeepers, sold and allowed to be changed. Obama is a politician. That's what he had to become and it's a dirty business. But even in the dirt there can be standards, regulations even, and he is out to restore them. Something occurred to me the other day. I couldn't have blamed Obama a bit if he had cut and run in September when the house of cards collapsed. He stuck it out, though, knowing full well what a balls-up mess he was walking into. That takes either a higher than average level of stupidity, or sheer guts. My money is on the latter. Personally, I found Michelle taking the queen by the arm to be an endearing gesture. It is something that one raised with manners and a sense of responsiblity would do were they escorting an elderly woman anywhere. One wouldn't want the old broad slipping and breaking a hip - lordy, talk about an international incident that would have created. "That takes either a higher than average level of stupidity, or sheer guts." admittedly there's no shortage of ego there, and vanity. But venal ego, I have every reason not to think so. This guy repeatedly did not take the pay-days he could have. He always chose the quicker and cleaner path to the top over the money. What drives him is his belief that he is in a special position; he is an outsider who knows America better than it knows itself, and he chose to take up a cloak of blackness and lead Americans to their better selves. How do I know this? It's obvious if you study what he said and wrote when he was in his twenties and thirties. He wanted to make a positive social impact, and it began to dawn on him that he personally might be what America needed. I suppose ego is necessarily wrapped up in sense of destiny. The difficult trade-off for him has been politics versus his family, as evidenced by when he looked for serious approval from his wife and her trepidations before giving the acceptance speech for the Democratic nomination. He asked her: "We ready to go?" Venality is not propietary to money alone. I supported and voted for Obama, but I am witnessing some troubling trends. For those who think he is the messiah, good for you. I truly hope y'all are right ----- But what I see is very disturbing.